The first line defines the 3 background fills, first is solid color and the other two are linear gradients. The background-insets offsets the backgrounds so they do not 100% paint over each other and the second background is 1px in from the outside and the 3rd background is 2px in from the outside of the button. The background-radius us setting the corner radius’s of the 3 backgrounds getting smaller as the backgrounds move in, this makes the gap between the borders a consistent 1 pixel all the way around. Padding adds extra space around the text to make the button bigger by default. Then the last two lines set the text color and size. That is all there is too it. I have not included styles for the pressed, over and focused states of all the buttons but they can all be easily added in a similar way. I have included a over and pressed state for the “Record Sales” button as a example. You can download the complete Netbeans project with all the code here. Now do you have plans to offer full stylesheets to emulate the major native LAFs? I know that’s a bit more tricky because the LAFs are not completely static, have to pick up colors, font sizes and other details dynamically from the native theme… still, I wonder if JavaFX’s styling support would take care of 95% of the work and make native LAFs much easier to develop than Swing. It should be quite possible to do a emulation of native look. There is still a good amount of work if you want it to read the native theme from the OS and turn that into CSS. We have not plans yet for doing this but there is nothing stopping anyone from implementing their own light weight version that just emulates a single native theme or if they really need it they could implement some code to read the native themes. This could be taken as a starting point from the Swing LAF code for Windows and Mac as it is all open source now. Most application today are designed in a style that complements the native look but is not a pure copy of the native look. Eg Skype client or Chrome or iTunes etc. JavaFX is great technology indeed. However as Steve Jobs teached us, small things are very important for the make or break of a technology. One such small thing for a cross platform GUI technology is the ability to emulate the native look and feel of the platform! Many programmer are very bad in design and often even don’t realize it or simply do not have the time and a designer is much too expensive for small projects. Therefore bad or alien looking applications will be the rule with JavaFX. And this will give a bad taste to the whole technology. This taste in turn will prevent considering usage for many projects. Many clients require this for their application! Especially the Mac crowd. So it is not possible to stress in the few words of such a comment how important it is that you add native looking CSS for the platforms and take this very serious for the JavaFX technology. How does the styling take affect, when the component dynamically changes its size (either due to Layout or Font change etc..). It is all dynamic and vector based. If your CSS rules use em’s instead of px, then it will scale according to the font size. As Richard said everything done in this sample is vector based so it will scale when the size of the button changes. 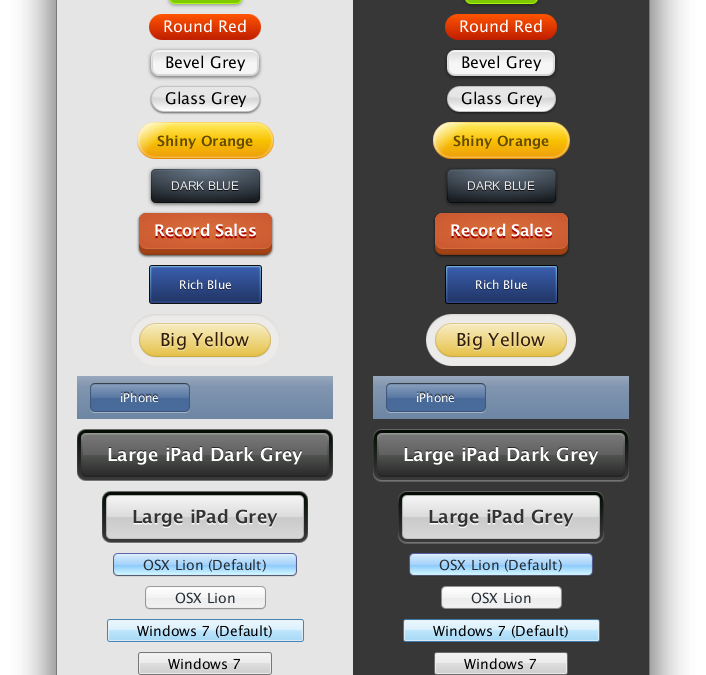 The size of the preferred size of the button is determined by the size of the Text and Icon + the padding. So if the text content or font gets bigger or smaller the preferred size will change. It is up to the layout container to listen for that change and resize the actual button control. The layout container may make the button larger or smaller than its preferred size depending on the layout rules. 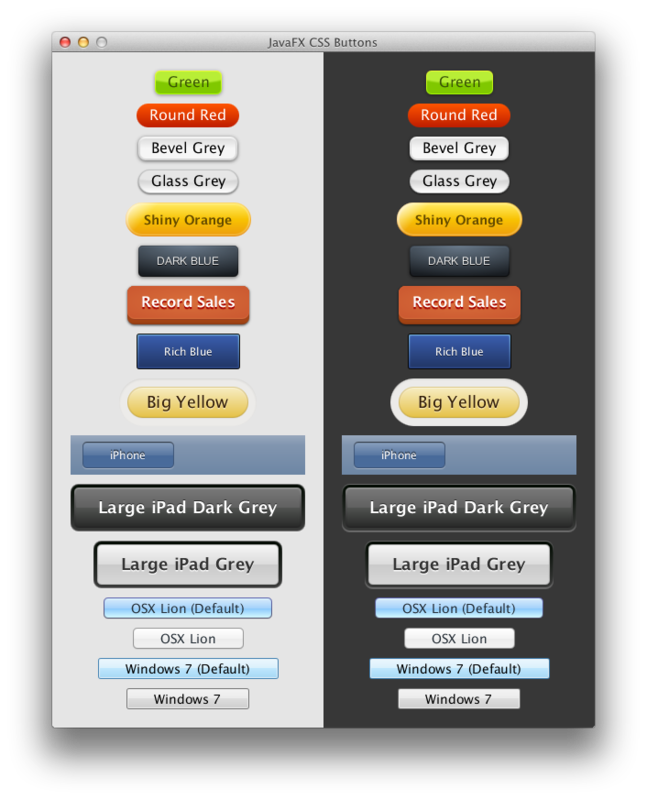 Once the button has been given a size by the layout container then the backgrounds and borders described in CSS are drawn. thanks for your excellent example. Wooow ! that’s really amazing ! I’m going to buy a secondary harddisk today and install windows 7 to work with javaFX, as my primary plaform is Ubuntu Linux !! I will have to wait a year.. Thanks to all javafx team !!!!! Since JavaFX 1.0 I’ve been looking into ways of using JavaFX for rendering a musical score. Now, JavaFX 2 is here and things do look better. Due to technical difficulties with the JavaFX platform before the new JavaFX 2 framework came out I solved my issues by not using JavaFX or nodes. What I’d like to do is take another look at how JavaFX might be able to handle my rendering requirements. The best way to do this will be to work with a JavaFX expert who I can share my requirements and current solution with and together we can come to a conclusion and solution. I’m just wondering if there is an opportunity to do this with someone? LCD AA for text is well underway and will be in a future release, you can track progress in JIRA. Implicit Animations / CSS3 Transitions is something I’d also be very interested about. Is this already possible with JavaFX 2.0? It would be awesome to be able to do this in the design domain, not having to trigger animations in event handlers. In our product we need to provide our custom “look”. This means that we need to replace caspian.css to our own scc file for whole applications. I don’t want to force developers to apply css to each Scene that they will create. I want something similar to Swing’s look&feell – load on startup and apply by default to every created component – is it possible? Then that will be applied to all the backgrounds. HTML CSS has border-radius which also applies to the background but there is no way to separate them. What we do gives you a lot more flexibility to create complex graphics with a single Node and without using images. With web CSS you would have to nest DIVs or use Images to create the same effect. Excellent job!!! it really helps me with my thesis work! thanks u so much! can any one help me please ? What’s that? That construct doesn’t show up on the javafx css documentation. Also I’ve tried doing the same in javafx 2.1 but it doesn’t seem to work. How can I add a dropshadow to text on 2.1? It Seems like something has changed recently, after making some test I discovered that “Text” needs to be changed to “LabeledText” that is the real internal text node inside a button. Awesome! Thanks alot for all the styles. Gave me some really good ideas on how to style my buttons and UI elements. Oh, one more question: Is it possible to specifiy the width and height of a button via CSS? please can anybody answer this question? I’m also curious. No it is not possible at this time. You can specify the padding which will cause a buttons width / height to be adjusted, but the width/height is fundamentally based on the layout container being used and the content (such as text) of the button. Hi Jasper!! You post is so nice! Direct and complete. But, I have to say as someone coming from XAML / MXML / CSS, that I find the multiple background colors, inserts, and radii very confusing! That should do it! All you are doing is specifying 3 background colors, white on the bottom (the highlight color — notice that it has a -1 inset, meaning on the top, it should be 1 pixel ABOVE the y of the region), then black (the shadow color — notice it has a -1 inset for the bottom, so it will be 1 pixel BELOW the y2 (outward) of the region), and the last is the flat fill. is there a way to put the image via css??? i am trying with -fx-background-image but itseems not to be the way… do you have any exbample of that? You can use either -fx-background-image, or -fx-border-image and associated methods. Our docs are not comprehensive enough (I learned it while reimplementing Region, and updating the docs in on my priority list for JavaFX 8). Can you post the exact CSS you are trying? Are you still there??? I haven’t solved the issue yet… the “efect” i want to reach is just an image button that changes on hover. That’s a really pretty nice job. Jasper’s original post and all the follow ups are excellent and really helpful. Thank you! 2) Is it possible to style a button like the tabs that are used in Chrome or the Thunderbird email client i.e. with two internal radii and two external radii, and possibly a shape like a trapezium with the shortest edges sloping)? I want to style a button that projects inwards from one edge of a Pane. David read my coments… hover is not posible on buttons if you want to set images… it’s great if your styles are only going to change colors… if you want to set images “as buttons” you may be think in use ImageViews with hover efect. What can be done for the hover, down and clicked state? And the CSS style for Windows 8 style? Al changes on colors and round corners, effects will work…. I got it… you can set your -fx-background-color:transparent and then set -fx-graphic to the url of your image then you will have a button with “just an image (if you want) or a transparent background for it, changing it with the hover event… is not the image property but the graphics one. Can you please guide if there is a way in javafx css to make button in which one side is straight and the other side is curved. That’s amazingly powerful and stylish, didn’t expected this from JavaFX, it’s going to be here for long time. Please help me if anybody having knowledge about it. Very cool. I was going to go with images for controls, but now see this that one can do just about anything by dynamically switching between advanced styles like these. I tried your interesting code with Java 8 + Netbeans 8. Netbeans says that classes VBoxBuilder, ButtonBuilder and ToolbarBuilder are obsolete. I would be much interested by an up to date version of you code. Thanks.